Whether it’s a metropolis like New York or the rugged countryside of the remote Highlands of Scotland: travelling to far flung places will always hold an allure for people. To make sure people find their way around these places, publishers produce a staggering amount of tourist guides. And what tourist guide would be complete without comprehensive maps to illustrate routes, points of interest and the like? 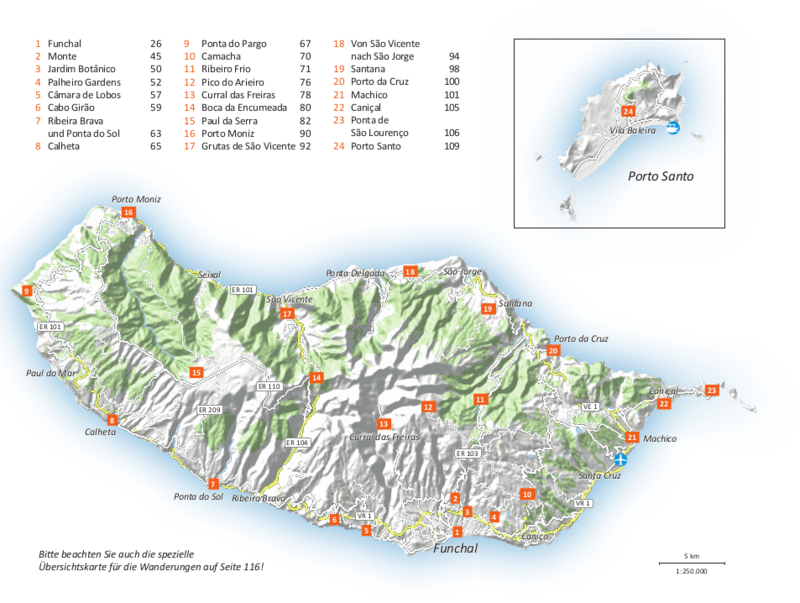 In this guide we will show you how to create the perfect maps for tourist guides. Points of interest, or short POIs, are places usually indicated by a marker on a map. In tourism, POIs are vital, as they show tourists where sights, gastronomy or lodgings can be found. As with any map that should help people find their way around, the base cartography used should at least include the road-network and place-names, allowing people to see at a glance how to get there. Topography, that is hill-shading and the like, is only of minor importance in that regard. Also, in order to quickly denote what kind of POI it is, signifying its role with the right icon is vital. In order to do this, make sure you use symbols which are commonly recognizable, like an airplane for airports, a burger for a place to eat, or for those more interested in liquid nourishment, a wine-bottle with a glass for places to drink. Many tourist destinations are used by visitors to go out and enjoy nature. In order to find the best routes for hikes or walks, it is a great idea to map out routes. As opposed to the above described maps for POIs, most important in these kinds of maps is the inclusion of topography, so visitors will see, at a quick glance, whether they’ll be walking up-hill or along a plane that won’t test their fitness. Apart from the many other features Printmaps offers, we also have a built-in geocoder that allows you to batch-upload and convert your addresses to their respective coordinates. It really is as easy as copying and then pasting data from a spreadsheet or a database column. Just click this Button in the editor: and you’ll have a familiar sight right in front of you. All you need to do is paste your content into the respective fields, and Printmaps will do the rest. 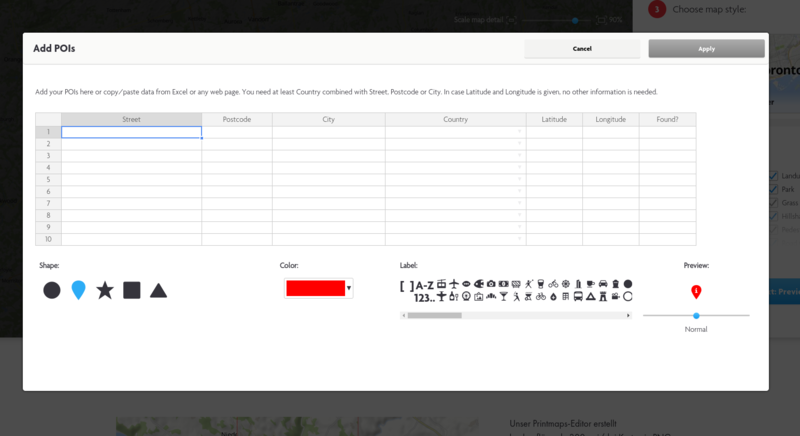 Once our geocoding engine has converted the addresses to their respective coordinates, you can go ahead and change the type of marker, the colour, icon or their size. All POIs will be saved in a separate layer, so once you’ve downloaded your map in Photoshop format, you can open it up and fine-tune the positioning of your POIs. Apart from being able to position as many POIs as you want, Printmaps offers a wide array of tools to make your life easier. Say you want to draw a border around the country or municipal area you want to emphasize? 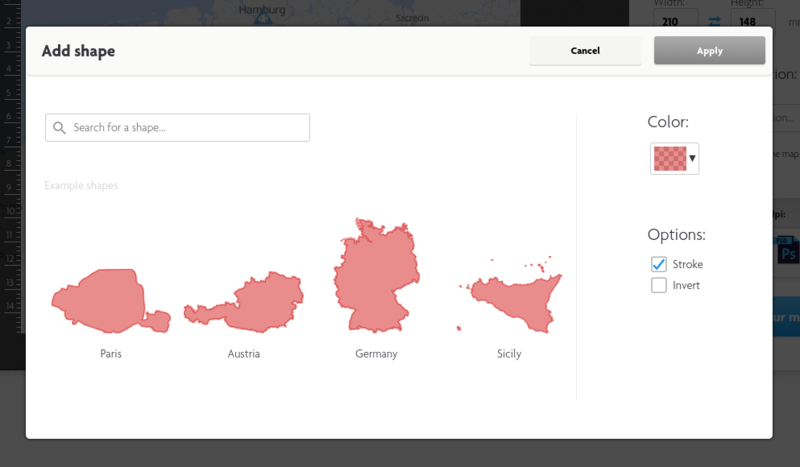 That’s what the Printmaps shapes tool is for. Click this button and then simply search what you’re looking for. Using shapes will not only help guide the viewer’s focus to the area you want to show off, but will also remove areas you don’t want to be visible on your map, whatever your reasons may be. 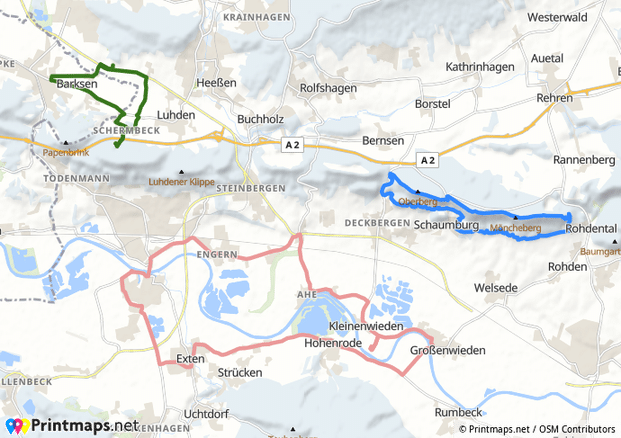 Adding maps with hiking routes is a walk in the park as well. Our route editor not only lets you draw your routes free-hand, it also utilizes a wizard that magnetically snaps to existing roads, allowing you to literally create routes within seconds. But that’s not all. If you have ever recorded your routes with a GPS-enabled device, you can upload these files – usually in GPX-format – to the editor and they will then be displayed on your map. Another great thing about it? You can upload as many routes as you want – and can fit on your map. Creating printable maps for a publication is not only a matter of having the right geo-tools, it’s also about using your own designs or ideas. With Printmaps, you get full flexibility, whether it’s the type of cartography used or the kinds of features included in your map. And once you’ve created and downloaded your map, it doesn’t just end there. 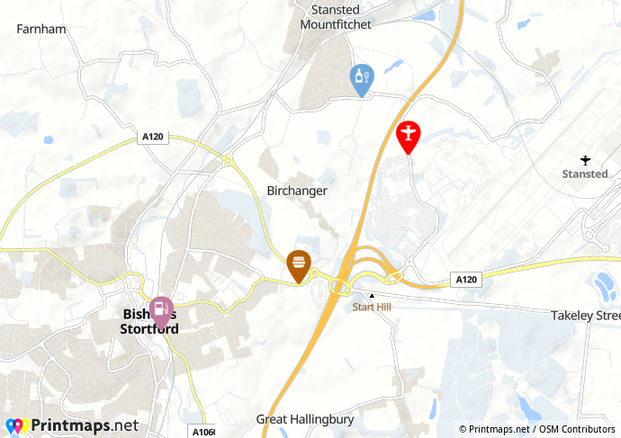 Want to add more details to POIs? Maybe add your own logos, more graphics, some text? That’s why we create your map in a layered PSD format, allowing you to change virtually anything you added to your map, down to single POIs. So why not just try our editor and see how you can transform your ideas into your ideal map fit for publishing?